7th & 8th AUGUST - MINOR FLOODS, GALE FORCE WINDS and LARGE SEAS. A trough that had brought rainfall to inland New South Wales moved offshore and formed a low depression on Thursday 6th. Friday the 7th saw gale force winds develop and these lasted 36 hours as the low which was expected to move rapidly SE, slowed and actually move NE. Winds were recorded at 65 knots by the Port Kembla signal station on Friday evening. Surprising little damage was recorded, although homes were blacked out in some areas. Parts of Robertson on the escarpment were without power for over 18 hours. Rainfall varied throughout the Illawarra, but was almost everywhere over 150mm for the entire event. 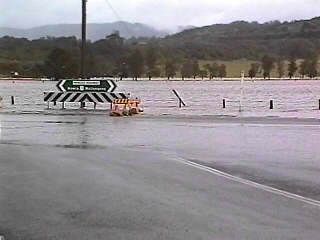 I did hear an unconfirmed report of over 300mm for Kangaroo Valley. Several roads in the area were cut, but only for a short time. The winds generated quite large seas, prompting the Bureau to issue a storm surge / large waves warning. 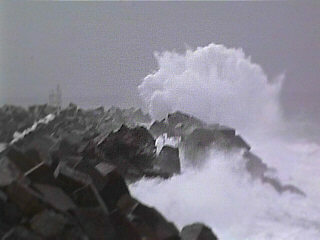 Waves peaked at around 20ft ( 5-6m ) on exposed coasts. Damage and erosion however was minimal, the media did a great job of sensational reporting in regard to the waves, being an experienced ( former ) surfer I can tell you that seas reach this size once or twice in most years. 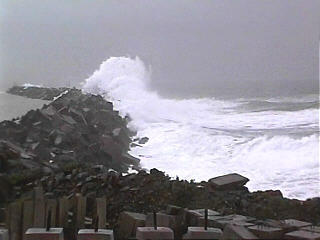 The video stills below show the waves hitting Port Kembla harbour breakwater on the Saturday ( 8th ). For some size perspective each of the cement blocks is 6-7ft high. The first image is at approx 6pm on the 17th August 1998. This was about 30 mins before the storm grow to peak intensity. But already it shows areas of up 100mm per hour rainfall. The second image is 8am the next morning and clearly shows the trough line, now just offshore. I live just below the label WOL and it was overcast with rain. Michael Bath of Australian severe weather who was located on the 16th floor at his work site ( right between the label SFS and BK ) was in sunshine and had a fantastic view of stacked Cumulonimbus cells to the east and south. See link below for Michael's account of the storm. Wollongong in my lifetime - let alone in my own neighbourhood. that it will be a long day. Next day began the task of the clean up. property would be undermined as the creek banks had been eroded away. Martin had the "OK" to re-occupy his house. Two photos taken the day after the floods. 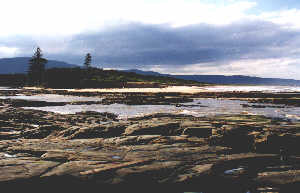 The first is where Fairy Creek enters the ocean at North Wollongong, the day before from where the photo was taken right across to the far side of the rocks was a sandy beach. The flash flood from fairy Creek has scoured the beach down to bedrock. This is a creek whose farest flung headwater is less than 5 miles away. 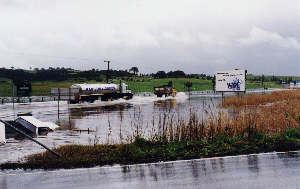 The second is traffic chaos at Springhill Road, Port Kembla, although just outside the main flood area this stretch of road as far as you can see in this photo was flooded to at least 1m ( 3ft ) deep, left behind was a slimy mud that caused traffic accidents. 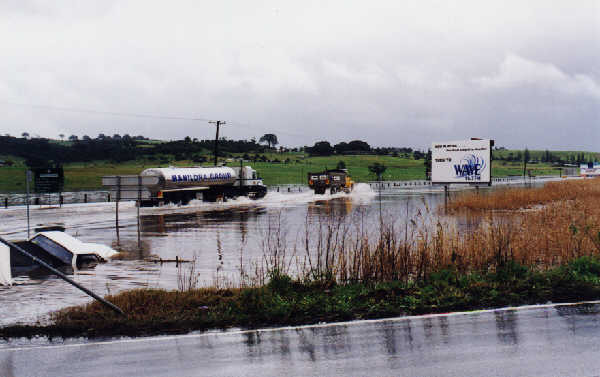 19th August 1998 - RAIN PERSISTS, ILLAWARRA HWY AND PRINCESS HWYS STILL CUT - Rain fell steadily overnight in the southern Illawarra, thankfully not the torrential showers of yesterday evening or Monday. During the day the rain broke to showers, which at times were briefly heavy. The overnight rainfall in the Kiama to Jamberoo area was enough to slightly rise the level of Minnamurra River and the Princess Hwy was cut south of Dunmore where there is no alternate route. To the north of Dunmore the Hwy remained fully closed to all but heavy vehicles. Emergency services personnel were helping guide motorists through the water south of Dunmore, this was wise as I had witnessed too many Yahoos ploughing into water over the last few days. I own a large diesel 4WD and took it easier through the water then some conventional car owners. It's not just because I'm cautious, I also consider other motorists and in flooded suburban streets you should also consider the that the wave you make may be splashing into somebody's front door. The photo shows the flooding, and the result for unfortunate motorist who lost the edge of the road. 20TH August - LANDSLIDE FEARS - A resident of the village of Mt Kembla was woken early in the morning by his barking dog. When he went outside he could hear trees snapping as a landslide tumbled down the mountainside. Several homes were evacuated. Residents were allowed back later in the afternoon after a geo-technical survey indicated that should a major landslide occur, the debris would miss the houses. Rockfalls and landslides are no stranger to the Illawarra, but the last weeks rains has made the situation worse. 30th August - RAINFALL RECORDS TUMBLE - August rainfall broke all records in the Illawarra, in some cases by double. Wollongong University recorded 763mm ( 30 + ins ) for the month. Other stations in the Illawarra were Kiama 728mm and Darkes Forest 744mm. 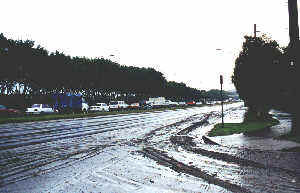 With Wollongong almost half the rainfall fell in the flash flood of the 17th August 1998. In the case of Kiama the record is significant in that several heavy rain events contributed.